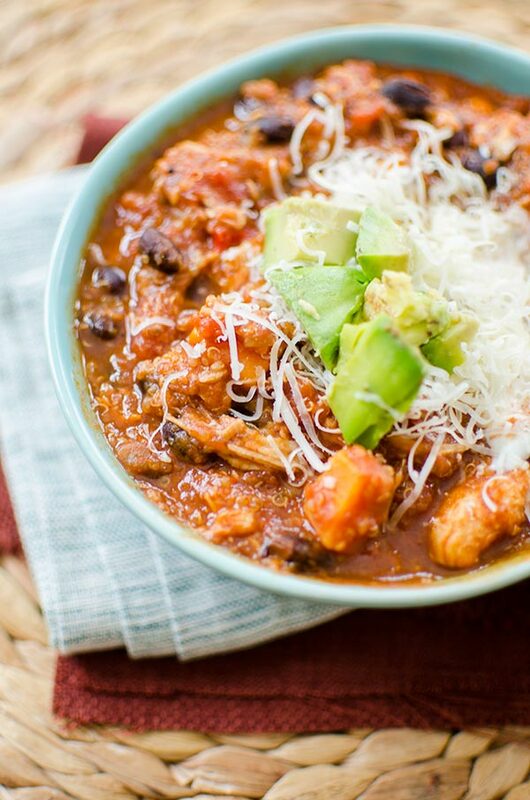 A healthy slow cooker quinoa chicken chili made with shredded chicken, quinoa, sweet potatoes and black beans. It was 9pm on a Thursday night, it was an unseasonably warm and balmy 15C (about 60F for those of you south of the border), I had just spent the evening with a friend down at the St. Lawrence Market for a wonderful fundraiser. We ate and drank our way through rows upon rows of booths from some of the hottest restaurants in Toronto. We live on opposite ends of the city, so once we parted ways, I decided to walk to the subway instead of taking the street car. I found myself walking along King street on the most beautiful February night I think I’ve ever experienced. The city was alive but somehow dead at the same time. A quiet calmness that gets busier and louder the further west you walk and the later you stay out. I suddenly felt an overwhelming sense of gratitude. How lucky am I to have been born and raised in this incredible city? To have opportunities that I wouldn’t otherwise have and to get to experience all that it has to offer? Sure it can be expensive, and draining and the transit could definitely be better, but when it comes to big cities, I think we’re pretty lucky. When I got home, I put this chicken quinoa chili in the slow cooker. 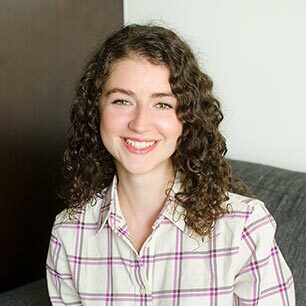 I know, some people think I’m a little crazy for putting on my slow cooker at night instead of during the day, but honestly this works so much better for my schedule! That way, when I’m up in the morning at the crack of dawn, my dish is done (meaning that lunch and dinner are ready to go). Seeing as though I wake up so early, it just isn’t possible for me to put something on in the morning for dinner (unless I want to wake up at 4am, which believe me, I don’t), so nighttime slow cooking is my jam. Plus I find cooking at the end of the day kind of relaxing and fun. If you follow me on Instagram, you’ll probably have seen my Insta story a couple of weeks ago where I tested this quinoa chili recipe. I think I’m going to try and do more of these throughout the week or weekend, give you a little peak into what I’m creating and working on. I am completely obsessed with this chicken quinoa chili because it is so packed with goodness and flavour and basically everything you dream of in a chili. You start by sauteeing the vegetables on the stovetop, a little onion and garlic with some red peppers and sweet potatoes, a hit of chili powder, steak spice and cumin and you’re good to go. All of the ingredients get tossed into the slow cooker, and before you know it, your house will smell amazing and you’ll have super tender chicken just waiting to be shredded. Heat a medium pan over medium-high heat. Add 1 tbsp olive oil, season chicken breasts with 1/4 tsp of salt. Sear for 3-4 minutes per side. Remove and place in slow cooker insert. Add remaining tbsp of olive oil. Add onion and cook for 3-4 minutes. Add garlic and cook another minute. Add sweet potato and red pepper. Cook another 3-5 minutes. Add spices and cook 30 seconds. Add diced tomatoes and scrape all brown bits from the bottom. Pour into slow cooker. When cooking is done, remove chicken and shred, add back in. Serve with desired toppings. 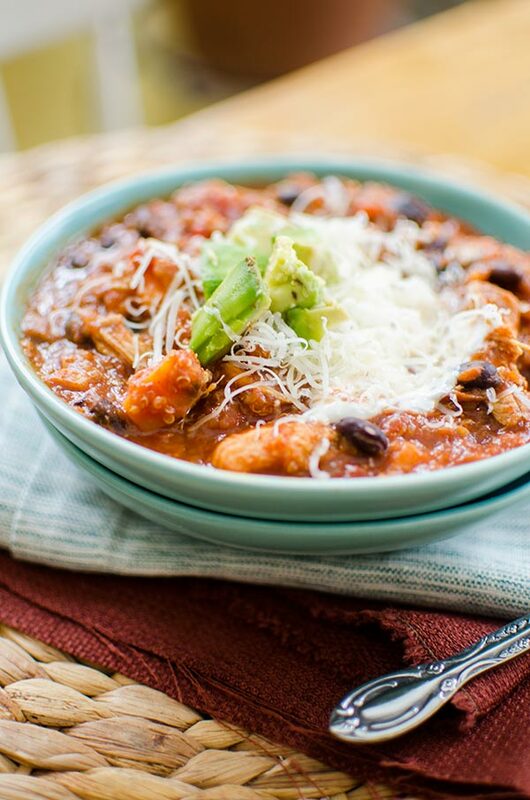 Let me know if you give this slow cooker quinoa chicken chili a try in the comments below.